Noah and his team are sent to take on a mission they never expected to see: investigating what looks suspiciously like an extraterrestrial base in South America. American military men have been turning up dead and vanishing, and all of the events are connected to the unusual activity. UFOs and alien creatures and visits from Men In Black are all part of the mystery, and even Noah is beginning to wonder what they're up against. When bodies start turning up that don't even seem to be human, the situation seems more and more like something out of a science fiction movie, but Noah is convinced. 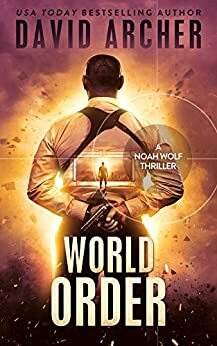 Teaming up with some of the most elite soldiers in the world, Noah and Team Camelot prepared to venture into what can only be termed alien territory. Extremely thought provoking & has plenty of action & twists to keep you on your toes. 5.0 out of 5 starsAnother couldn't stop reading it. The Wolf is saving the world, the whole world this time!,but from what? 5.0 out of 5 starsAnother great read. Loved it , like usual . It transported me into Noah's world. A scary but effective place to be. Can't wait for a Swaggart series.